Will the Koni shocks make the ride less comfortable? No, its the opposite to what you would expect. The enhanced stability and lack of rocking motion at low speed maneuvering transforms the car. We only sell them because they are excellent and the ones on our Range Rover have done 70K miles and are as good as the day we fitted them. They have been in quarries, underwater, in mud, and been 130 mph in Germany. Well we would not replace them with anything else even after 6 years and massive abuse. Koni have, over the years, gained a substantial reputation for quality and excellence in the production of suspension units. Instead of supplying a shock absorber to fit a whole range of vehicles, Koni shocks are developed and valved for individual applications. To understand the main advantage of the Koni shocks when used on a Range Rover, it is necessary to understand what is happening when you are cornering. When cornering, the shock absorber on one side is being compressed and is trying to hold the weight forces of the vehicle. Heavily uprating the shock absorber will partially resist this, but when uprating is excessive it causes normal driving to be very harsh. The shock absorber on the other side, however, is being stretched, and standard shocks offer very little resistance to this. 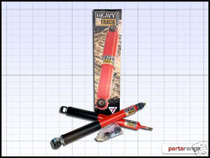 These shocks are designed to not only resist being pushed down, but are valved to strongly resist the lifting force (stretching), therefore controlling body roll while retaining a very comfortable ride.